It’s been a while since we showcased a cake topper, so today felt like a good day to find that perfect accessory for your wedding cake. Now we all know that your wedding day is supposed to be the happiest day of your life – so why not showcase that happiness with your cake topper? Who needs a classic ‘bride and groom’ cake topper when you can add a bit of international flair to your cake with this “double happiness” cake topper! The symbol of double happiness is created by joining together two Chinese characters for happiness, and it represents the joy of “partnership and balance” that happens when two people are joined as one. I really love this cake topper – not only is it unique, but it’s a nice way to wish good fortune and happiness on the happy couple! This particular cake topper is about 4 inches tall and would look stunning on your wedding cake – alone or perhaps as part of a floral centerpiece. 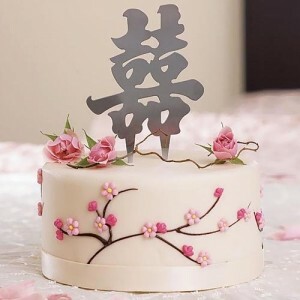 You can find the double happiness cake topper here.